Lightly coat the butternut squash and roast in the oven for 30-40 minutes until it is tender and nicely roasted. Meanwhile, saute the chopped shallot in a little oil, until tender. Put aside until the squash is ready. 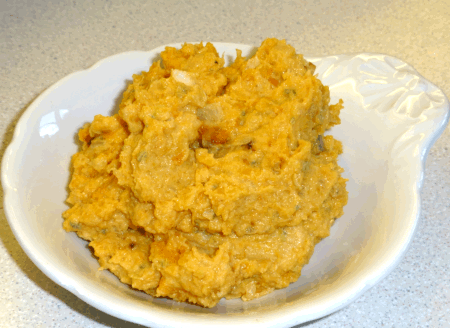 When the squash is ready, let it cool and put it in a food processor with all the other ingredients. Whiz all the ingredients together - I like to leave a little texture in it. 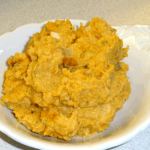 Alternatively you can use a potato masher to mash together the filling. Wash and dry the food processor and add the flour, salt, and Xanthan gum and give it a quick whiz to mix them all together. Lightly beat the eggs and add them and the oil to the mix. Whiz until a dough forms, it should come away from the sides of the processor, and be slightly tacky to touch. The texture should be satin like and smooth. If it is a bit dry add a little more oil. I like to finish off the dough by hand on a clean floured surface. If it is too tacky add a little more flour. Put it a bowl covered in cling film and rest in the fridge for 30 minutes. 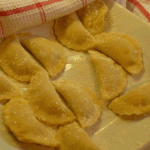 Cut out circles of the pasta, using a pastry or ravioli cutter - 7cms is a good size. Place a teaspoon of the filling in the centre of each circle, and use a pastry brush and a little water to wet the edges of each circle. Fold over into a semi-circle and gently squeeze the ravioli edges together. 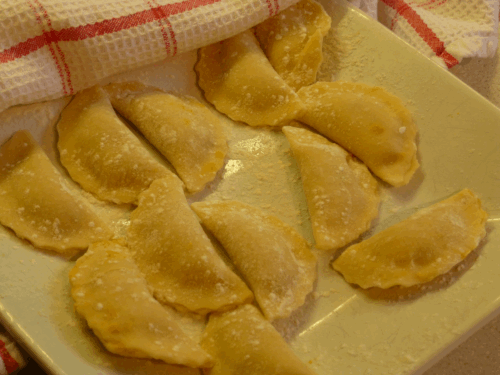 Lightly dust a plate with flour and put the ravioli on the plate covered by a cloth until needed. 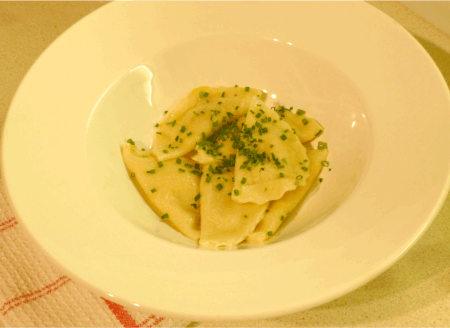 You should get about 2o ravioli from the recipe. Cook the pasta as you would do normally in a large pan of boiling water. This pasta takes longer than you would think for fresh pasta - around 10 minutes - test one first so that you can get 'done-ness' that you like. Serve with some melted butter and sage and chives or with a little tomato sauce.